Taylorsville resident Robert Ray Lyman, 61, is accused of starting last summer’s fire at Brian Head that burned over 71,000 acres across parts of Iron and Garfield counties, destroyed 13 homes, triggered the evacuation of about 1,500 people and cost $40 million for fire agencies to combat. “Unsurprisingly, the media outlets serving Iron County covered the fire with a frenzy,” attorney Andrew Deiss wrote in a motion filed July 12. Much of the media coverage included “the false assertion” that Lyman started the fire with a weed torch or similar device. “Unfounded rumors” over social media – often attached to the online comment threads of posted news articles – spread claims Lyman had been drunk and had been told by a police office not to burn anything. All of the rumors are false, Deiss wrote. “More over, an online poll, social media posts, and … comments all reflect a strong hatred of Mr. Lyman,” the motion reads. The negative press and how far-spread it became are among the factors that Deiss and fellow defense attorney, Matthew Kaufmann, claim will prevent Lyman from getting a fair trial in Iron County. Deiss wrote that he came across at least 57 online news articles addressing the Brian Head Fire. Across those articles, Lyman’s name is mentioned 116 times. Deiss noted other social media posts that show how much animosity people in Iron County have against his client. Another reason supporting a change in venue is the size of the area. Brian Head, where Lyman has a cabin, has 100 full-time residents, while Iron County has an estimated population of around 50,000. “In such a small community, there is a reasonable likelihood that the fire directly or indirectly impacted the prospective jurors’ family, friends, or neighbors,” Deiss wrote. Lyman may also be seen as a potential outsider by Iron County residents and therefore may not be allotted the same measures of impartiality he otherwise might be given. 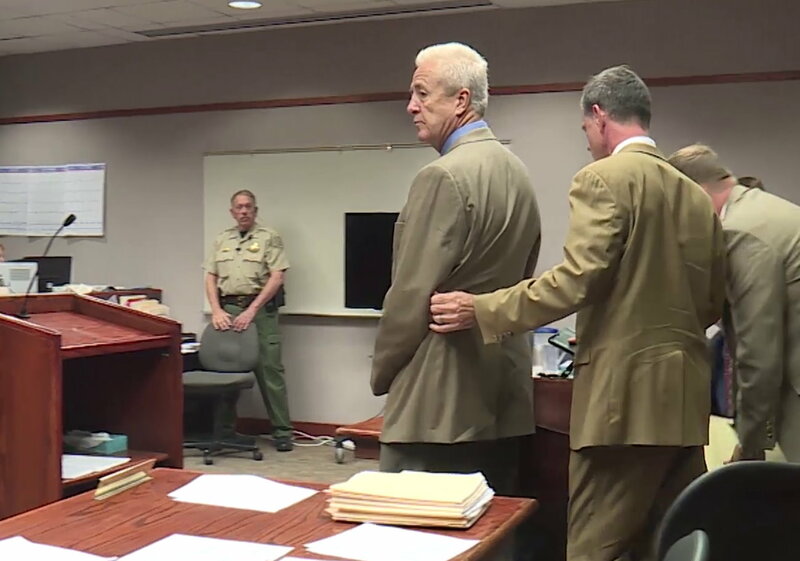 Lyman has pleaded not guilty to the charges and is scheduled for trial next month in 5th District Court in Cedar City. BS! That place has been a tinderbox just waiting to happen. If it wasn’t him, it would have been someone, or something else. Was he an idiot? Absolutely! But we should just be thankful nobody died; I’m certain he is. I’m sure he will spend the rest of his life with guilt, and remorse for his actions; and he should; it’s the best punishment he could receive. and maybe he’ll spend the rest of his life doing “community service” warning others, and who knows, he may actually be able to help more people avoid all the pain & hurt, just by sharing his story with others. What more do you want? Jail? Prison? For what? A crime we know with 100% certainty he will never commit again. If he’s not already bankrupt, he will be soon. Right now, this is a lose/lose for everyone; and he’s the only one who can turn that around for all of us. Or we could burn him at the stake? How is he the only one who can turn it around? And on a side note, most crimes and legal punishments are a lose lose situation. There is no way $4k and and 18 months in jail matches the scale of his disastrous outcomes of this fire though. Well, if he moves forward with his life, tries to make amends, and maybe does wildfire warning lectures for free to “at risk” people and communities or something like that? There is no limit to the things we could come up with; and with any luck, get a Judge with a little outside the prison-box thinking and imagination, the sky is the limit, or not, but it won’t hurt to try. Not being able to try different things hurts our country immeasurably. We will never know if he goes out and makes an impression on someone with his story, and they end up saving themselves, or others because of him. If he sets into action something like that, he would give us all, a “Win” of the very best kind. Baddy, you are the epitome of the stupidity of someone who believes everything he thinks. Based on your inane blather I would conclude you haven’t a clue concerning the Brianhead fire. Maybe we could use you as a substitute for this arsonist thug. And where you going to give us some of your ideas? Or are you cool with 18 months in prison at $3000 a month on the taxpayers? Speak up boy? If you want anymore of my comeback, you can wipe it off your honeys chinney chin chin! So enjoy! and the firebug had much worse intentions of causing a hanius act and should be tried for attempted murder. How about this – since we know there is NO WAY he can ever pay the cost of fighting the fire, have him pay the fines, but instead of jail time, have him spend the next 18 months (at least 40 hours a week!) planting trees on the burn scar to replace the ones that were burned. It’s damn hard work and I guarantee he’d wish he was sitting in jail. As for the people who suffered loss of property, they should file civil suits against him. They’ll most likely never get anything, but they’ll make him regret his decision for the rest of his life. This guy is a real piece of work. Hey Bob, how do you even live with yourself? He must be fueled by idiot friends just like him. You did it Bob, now it’s time to take responsibility for YOUR actions. Its a smart strategy by the defense and they would be remiss not o bring it up. I just wish the prosecutor would have brought heavier charges as the defendant is undoubtedly going to get less than the maximum. The prosecutor failed the community. There wouldn’t be so much hatred toward him if he would just plead guilty. Wasting money and keeping his name out there certainly does not help him. He’s an ARROGANT liar. Yesterday I was out at beautiful Yankee Meadows reservoir and I made the comment that ly -man should drive around and see all the damage he’s done. What a piece of work he is AND a POS. “Potential outsider,” I wonder why…… So how did it start, just admit it, we’ve heard your phone call. And he blames others for not stopping him! I’ve never seen him show any remorse. If I thought the guy actually showed any real remorse, I’d consider his request. At this point I’ve not seen any on camera admission of remorse by this guy for his stupid actions. NONE. If that would prove his guilt in being responsible, uhhhh duh, he IS the source of the ignition for the fire. True, the forest was in bad shape, but what was it that the well known Utah attorney says? There’s no such thing as accidents, only bad decisions, made by foolish people? (Or something like that, I’m paraphrasing.) Well if He’s the one that made that bad decision, then He should face the highest possible consequences for that decision. There are safe options for clearing brush and debris away from a cabin, he could have chosen one of those. What about the loss of the life of Bryan Burr, who’s company was trying to assist in the reseeding and planting in the burn scar area? A good man that would not have even been here, if not for the actions Lyman. Just monetarily and safety speaking, now this area is faced with dangerous and damaging flooding EVERY time it rains, every year during runoff in the Spring, millions of dollars will be spent fixing roads, clearing mud, attempting to restore the holding pond and irrigation system to the Parowan Valley, the resulting dead lawns and reduced crops that residents and local farmers will have to deal with, in turn reduced values of properties and loss of $$$$$$$, loss of local resident’s livelihood, local business owners that lost $$$$$$ last Summer and continue to do so as a result of lost #’s of visitors, the businesses that supply local businesses, the stress all local people feel as a result of lost revenue, difficult family financial decisions of locals effected by this trickle effect….this effects much more than you can even quantify. I just hope that there is no more loss of life associated with the conditions left from his actions. Not just the folks who lost homes, it’s too bad the residents of the towns of Brianhead and Parowan cannot sue him for damages too. No matter how many trees are replanted, it will take decades to stop this flooding. SO yeah, I think he does deserve to have highest possible penalties. I hear ya, I do. It’s a shlt sandwich all around, and everyone gets a bite at tax time. I would just like to see the CJS get a little more creative with non-violent offenders; and maybe engineer some payback for all of us instead of throwing an old fossil like this guy in prison for 18mo. That’s another 50k too the taxpayers, and as old as he is, what if he needs emergency quadruple bypass? We eat another 300k for that. God forbid he needs reassignment surgery like the “mesaman”? Put yourself in this guys place. It would take about 5min of being attacked, before anyone would drop the guilt, and start reacting negatively. It wouldn’t even take most people that long. Now he’s “dug-in” and we are all going to pay for it, starting with a trail that there is always a possibility he pulls an O.J. out of. Wow! Wouldn’t that freakin sting! I know, too much “Snowflake” theory.